Air Berlin: Air Berlin online check-in worked seamlessly for the first flight, the flight from Chicago to Berlin. The online check-in for the second flight did not work. This is due to the Air Berlin computer systems mixing up passport information for one of the individuals I was traveling with. 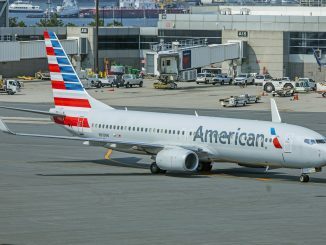 We called Air Berlin and they told us to call American Airlines because we booked the ticket through American’s website. After calling American, the customer service representative assured us everything would work at the airport. We got to the airport and as told, the woman fixed the problem right away and we were checked in within 5 minutes of arriving. Lufthansa: Lufthansa online check-in did not work for either flight for some reason. It appears as if this was due to the fact that it was booked via United using MilagePlus miles. The check-in at the airport was easy. 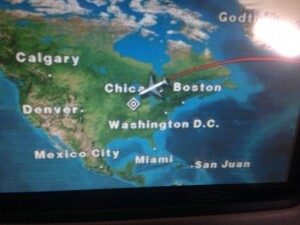 Luckily, we arrived just before many other Lufthansa passengers and watched a large line form behind us. The check-in process was slow, but being the first in line meant we did not have to wait. We did have an extra bag to pay for and for whatever reason it could not be paid for at the check-in desk. 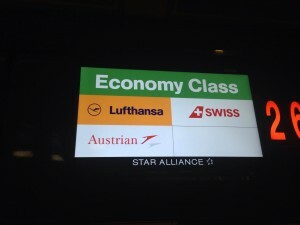 Instead we had to go to a Lufthansa ticket counter. We stood in line for about 15 minutes as there were people purchasing tickets in front of us. 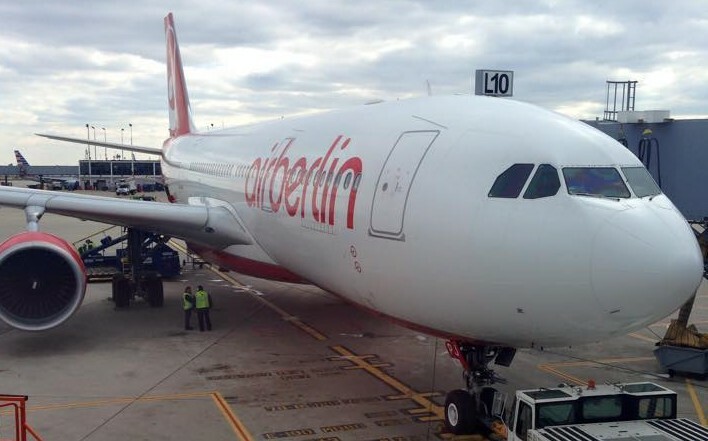 Air Berlin: The boarding process for Air Berlin’s long haul flight was organized and quick. First up was Business class, then groups A, B, C, and D. Boarding took about 35 minutes which I thought was pretty quick for a 298 passenger A330-200 using only one jet bridge. The second flight from Berlin to Rome was somewhat chaotic. It was scheduled right in the middle of one of the departure banks for Air Berlin out of terminal C. Announcements could not be heard very well and they just called out for all passengers to board despite assigning everyone a boarding group. Everyone rushed the gate, but boarding only took 15 or so minutes. 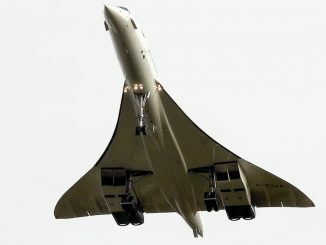 In typical Berlin fashion, the aircraft was boarded using stairs. 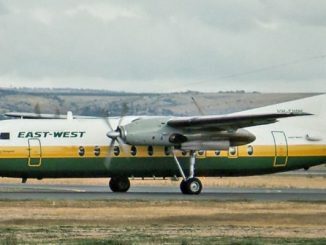 The back half of the plane boarded on the rear stairs while the front half boarded via the forward stairs. I was in 8A so I boarded the A320 using the forward stairs. Boarding the A320 in Berlin. 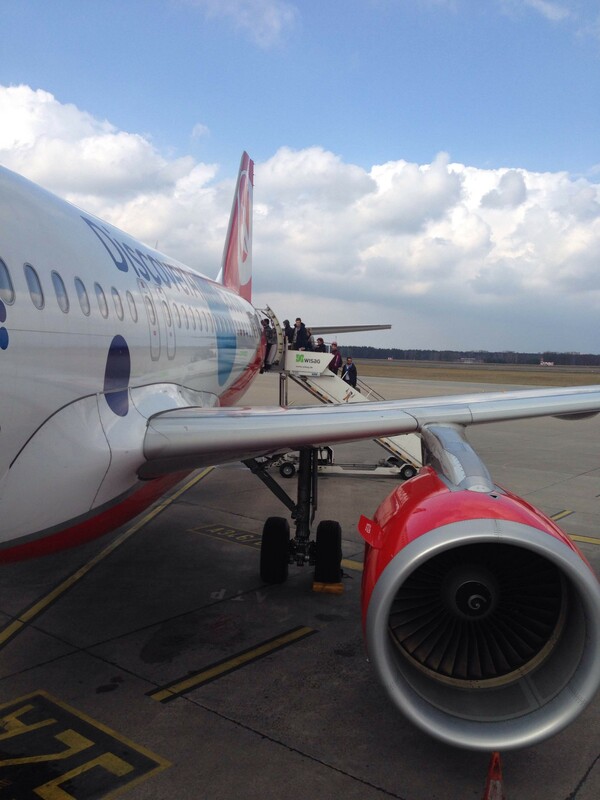 Air Berlin: On the flight to Berlin, I sat in seat 38A right behind the wing. Upon boarding, every seat had a pillow, a blanket, and an amenity kit in it. The amenity kit included a toothbrush with toothpaste, a pair of socks, a sleeping mask, and a pair of earplugs. The seat itself was very comfortable and the legroom was not bad until the person in front of me reclined all the way back. I’m 5′ 10 and my knees were up against the back of the seat in front of me when it was reclined all of the way back. The seat pitch is listed at 30″, but I think that may be a bit generous. The under seat storage was also restricted as there was something below each seat so my laptop bag could not slide all the way under. With no obstruction, my laptop bag and my camera bag fit under the seat with no problem. Other than my bag sticking out slightly, the storage was fine. On the short haul flight I sat in 8A. I found it very comfortable and both of my bags fit underneath the seat in front of me with no issue. Legroom was about average for an A320. Lufthansa: On the first leg from Rome to Munich, I sat in 7A. The seat was a slimline seat, but unlike many slimline seats it was very comfortable. Luckily, there was nobody in the middle seat. Even if there had been someone in 7B, I do think it would have still have been very comfortable. 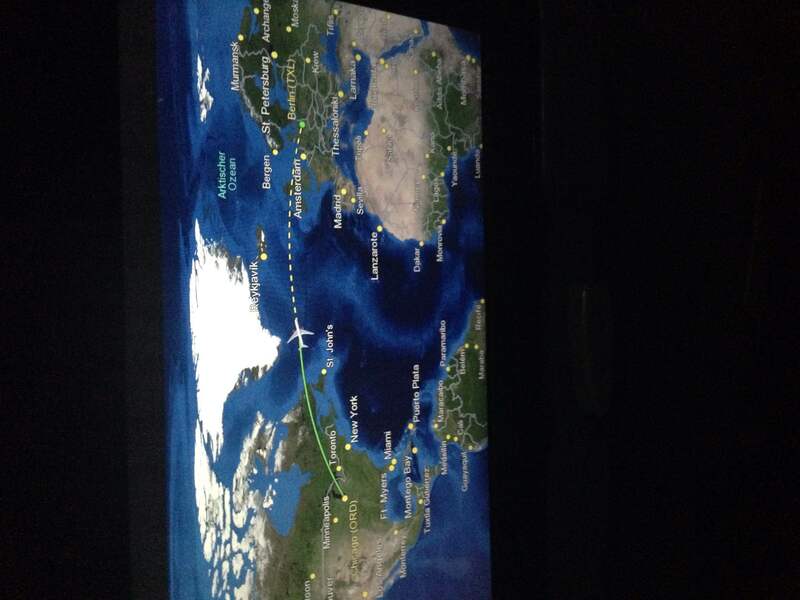 On the long haul flight from Munich to Chicago I sat in 37K. The seat design was old as I believe the economy seats on this aircraft were still the original seats on the 8 year old aircraft. the seat itself was very comfortable and legroom was sufficient even when the person in front was reclined all the way back. The only negative is the large equipment box underneath the seat that took up about a third of the storage space underneath the seat in front of me. 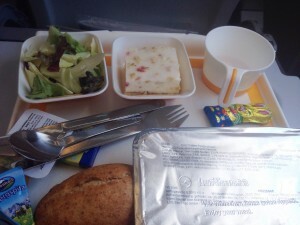 Air Berlin: Being an overnight flight, dinner was served on the way to Berlin. The first drink service was served about an hour into the flight. Complimentary alcohol was offered with the drink service, unlike any U.S. airline I’ve flown on except Horizon. A flight attendant walked through the cabin and passed out a menu to each passenger. The theme of the menu was American food. 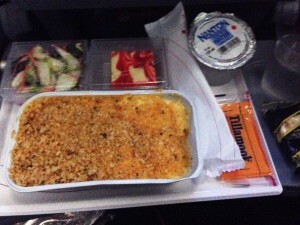 There were two choices for the main course: Chicken fried steak with mashed potatoes, or Mac and Cheese Dinner was served about two hours into the flight. 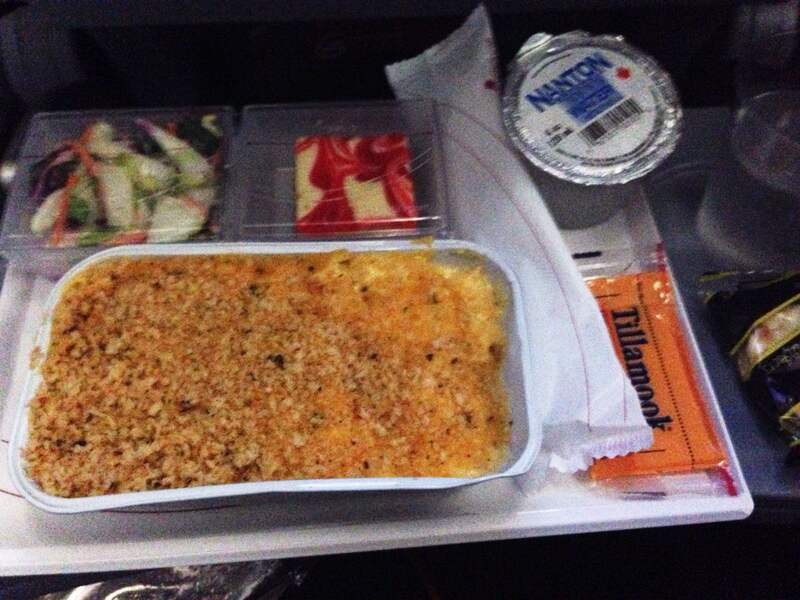 I opted for the Mac and Cheese as chicken on an airplane never seems to be very good. Also on the tray was a roll, a salad. a slice of cheddar cheese,, a little cup of water, and a piece of strawberry cheesecake. The Mac and Cheese was pretty tasty and it was plenty warm. The other two people I was traveling with both opted for the chicken and said it was not very good and definitely was not the texture chicken is supposed to be. Normal drink service was served with dinner as well as the water already on the tray. After dinner, a flight attendant walked through the cabin and handed out full size water bottles to each passenger. I thought this was a nice touch and was easier than going through the cabin with a cart of water all night. An hour and a half prior to landing, a European breakfast was served. The tray consisted of salami, turkey, and cheese, a raspberry yogurt, a muffin, and a roll. The breakfast was decent, but definitely not as American as the dinner. Drink service was also served with breakfast. On the flight from Berlin to Rome a snack was served. I slept through it as I did not sleep on the first flight or during the six hour layover in Berlin. Drink service was also offered. Air Berlin is regarded as a low-cost carrier, but they served a snack on an hour and a half flight which I found surprising since I’ve been on a 9 hour domestic flight to Hawaii with nothing except drinks served. Chocolate hearts were passed out by a flight attendant on the way off the aircraft which was a nice touch. 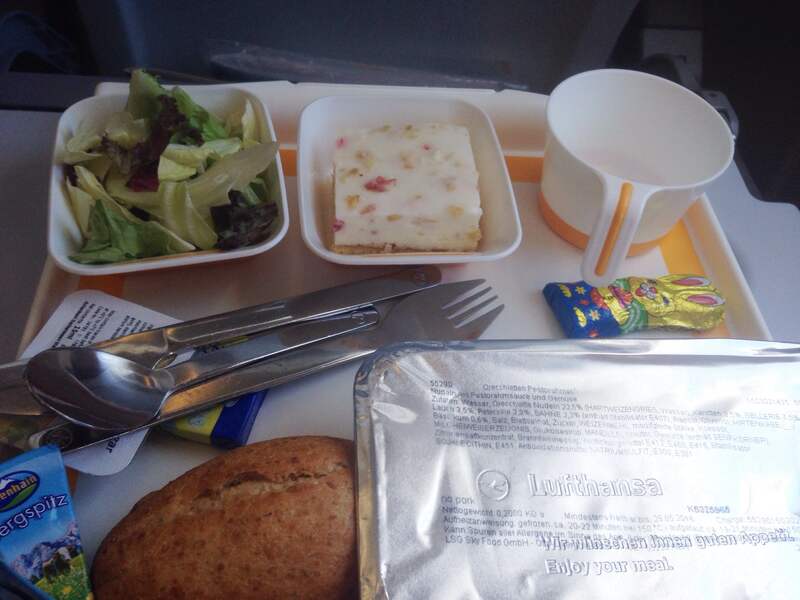 Lufthansa: The first flight was in the morning and a breakfast snack was served. Every passenger received a chocolate croissant as well as drink service which I found pretty good for a flight that lasted just over an hour. The croissant was very good and one of the best things I have ever had when flying. On the flight to Chicago, as soon as we reached cruising altitude, flight attendants took to the cabin to pass out a mixture of plane-shaped pretzels and animal crackers. Following the snack, they came through with drink service offering complimentary alcohol, like Air Berlin. After the drink service. meal service began. No menu was passed out and the choices for lunch were announced over the PA system. The choices were a vegetarian pasta or chicken with rice. Staying away from the chicken again, I opted for the pasta. The pasta was in a pesto sauce with carrots and onions. I’m not really a fan of pesto sauce, but it was not announced that it was a pesto sauce. The pasta was not bad though. I think someone who likes pesto would have enjoyed the pasta. Also on the tray was a salad, a small piece of cheesecake, a roll with butter, a small portion of cheese, and a chocolate rabbit due to the upcoming Easter holiday. Drink service was served right behind lunch. After lunch, the flight attendants set out cups of juice, water, and ginger ale in the galleys. Packages of the pretzel and animal cracker mix were also in the galleys. Many of the flight attendants went to the crew rest I believe, but occasionally one would pass through picking up garbage or offering drinks. 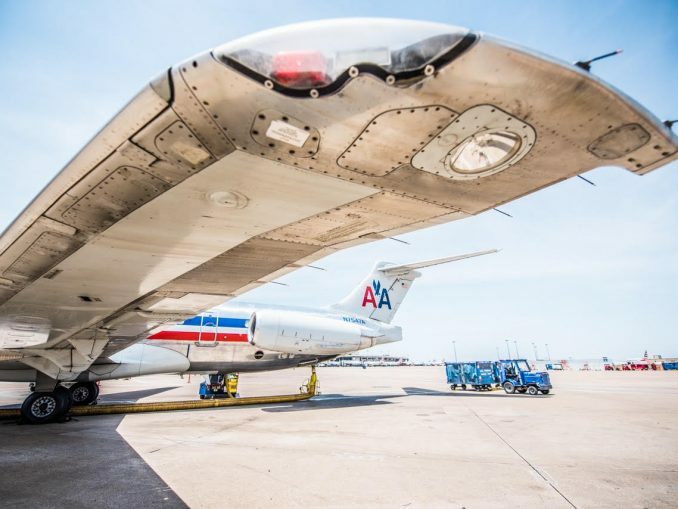 About an hour and a half out of Chicago the flight attendants all came out of rest and a snack was served. The choices were bacon and onion or the vegetarian option with just vegetables. I opted for the bacon and onion option. It was good, and that’s coming from someone who doesn’t really like onions. The final drink service was served after the snack, and then we began our descent into Chicago. 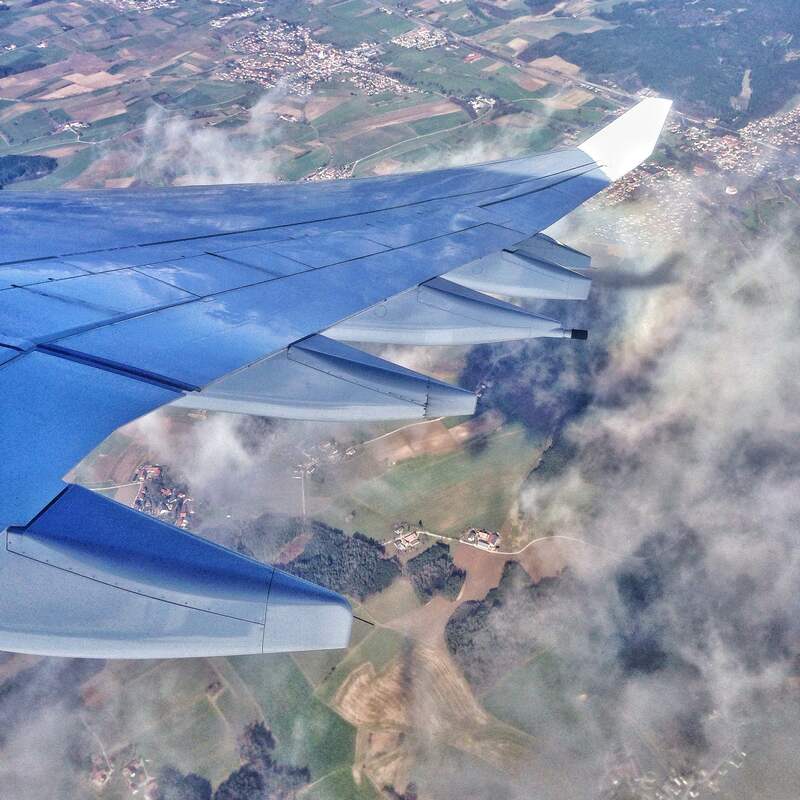 Air Berlin: The entertainment system on Air Berlin was truly incredible. The screen was a very high resolution and it was a good size. The touch screen worked well and responded very quickly. There was a good selection of movies and TV shows, and a fantastic variety of music. The music was divided into albums and every song in each album could be listened to. The system even had a few games such as Sudoku which kept me occupied for a while. After not having personal entertainment on my previous trans-Atlantic flights, I found this to be amazing. The headphone jack was also a standard headphone jack so passengers could use their own headphones. For those who did not have their own headphones, a flight attendant passed through the cabin handing out complimentary earbuds. Next to the screen was a USB jack which was nice. I was able to keep both my phone and my iPad at 100% by the time we arrived in Berlin despite using both for a while on the flight. Lufthansa: The in flight entertainment on Lufthansa was somewhat disappointing. The systems themselves were clearly very old. The headphones provided looked like they were from the 90s and they had to be used as a double jack. Not knowing this, I did not bring my adapter for a double headphone jack. I did not want to take my noise canceling headphones off to watch something unless it was really worth watching. I looked through the movie and TV shows, but the selection was not all that great and there was nothing that was worth watching with the provided headphones more than just listening to my own music with my noise canceling headphones. The screen itself was a very low resolution and the touch screen was very laggy. It took 5 or 10 seconds to respond to each command. 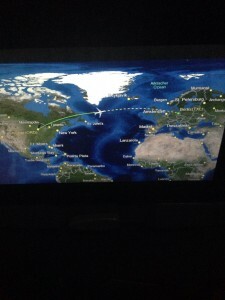 One of the people I traveled with had a screen that did not work at all even after the flight attendant reset it. The screen next to it in an empty seat did not work either. I opted to entertain myself with my iPad and phone rather than using the disappointing in flight entertainment system. 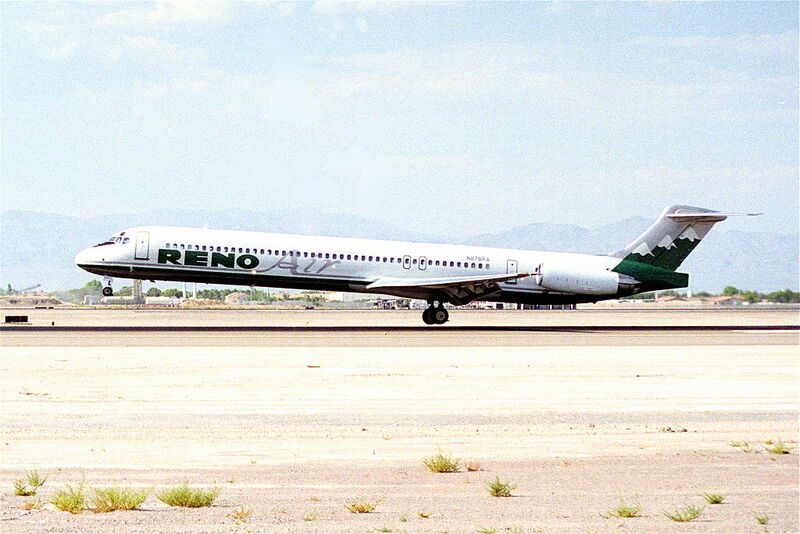 The interior on this aircraft was very clearly outdated and there was no in seat power. Strangely enough, the only power outlets I found on the whole aircraft were in the lavatories underneath the cabin. Only Lufthansa A340-600 and the Thomas Cook A330-200 have lavatories underneath the cabin. Air Berlin: Air Berlin was a very good airline. 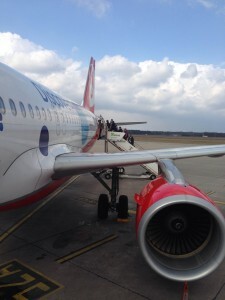 I was not expecting too much as they are a low cost carrier, but Air Berlin exceeded my expectations by far. Crew was friendly and the entertainment system was incredible. I would recommend Air Berlin to anyone looking to get to Europe without breaking the bank even if a long layover in Berlin is required. Lufthansa: My return journey on Lufthansa was somewhat disappointing. 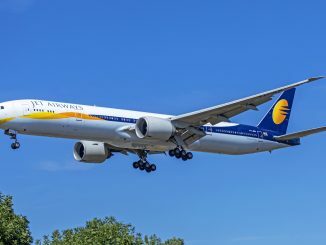 They have been ranked pretty high in terms of airlines. 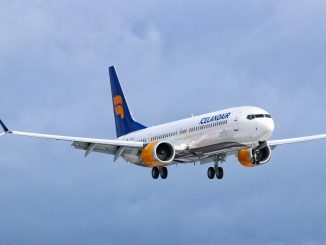 The crew was very friendly and the service was good, and the flight overall was decent. 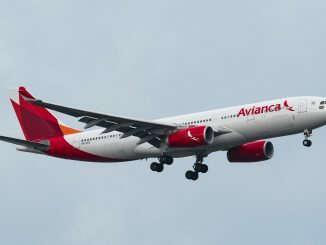 The A340-600s are in good shape, but the systems are outdated and the economy cabins are in desperate need of a refresh. I think if I had flown on the 747-8 or A380 my opinion of Lufthansa would have been different. I was very impressed with Lufthansa’s terminal in Munich and that is one place a layover isn’t so bad.